For this site to accomplish its mission of educating and informing, we need everyone’s cooperation in bringing ‘new finds’ to our attention for inclusion in this website. Steve Raiche is an experienced collector of early American license plates from Lakeland, Florida. We developed this site to educate and inform the general public about old license plates – an obscure but fascinating aspect of automobile history during the first decade of the 20th century. Autos at that time were a novelty, just starting to replace animal power as the primary mode of local transportation for individuals and goods. 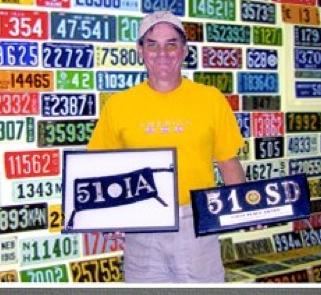 Although Steve has been collecting and researching license plate history for over 50 years, neither he – nor anyone else – has all the answers as to what cities and towns used auto plates at the dawn of the last century. Official records are not easily located or studied, if they still exist at all after 100 years, and newspaper accounts from that period are rare. If you own or know about any early license plates, like the ones covered in these pages, please let us know so we can include it for reference. Experience tells us there will be many new finds as time goes on! Thank you, one and all. Now ENJOY!